I haven't posted in a few weeks - mainly because I haven't taken as many pictures of the little man. 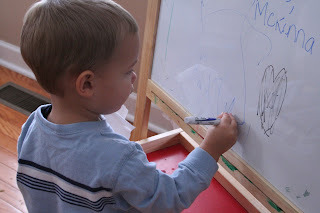 This week we used the easel and the dry erase markers - scribbling and erasing can be so much fun! 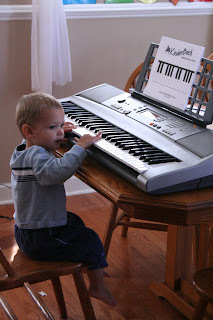 Playing the keyboard and just making a little noise. 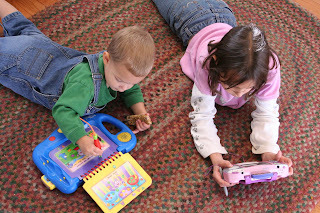 Relaxing with the leap pad and pretending to be a big kid like his sister. 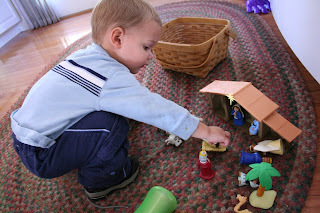 Pretending with a new nativity set that Mommy gets to review - this one gets a big thumbs up from me since Kaleb started saying 'Baby' and bringing me Jesus all the time!! 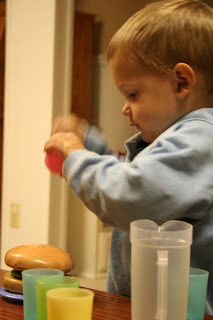 ...who decided that it would be much more fun for Kaleb to play 'Spank my Bum' with him instead of playing with Mommy. (It was rather funny to watch). And I got brave and brought out the finger paints for everyone. 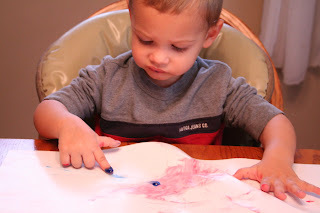 This picture shows that Kaleb isn't too fond of the taste of finger paint (shocking, I know). And this is Kaleb's first official painting. Which is proudly displayed on our wall and he points to constantly. Thanks for stopping by! Be sure to visit Carissa at 1+1+1+1 for more Tot School showings! 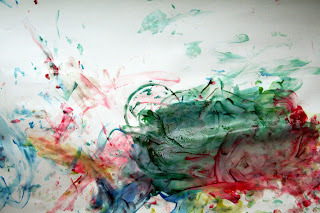 LOVE his finger painting! And the bum spanking is too funny-sounds like something that would happen in our hosue!